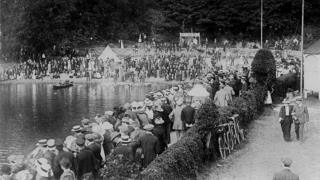 Revealing images from 100 years ago show how people flocked to a rural Staffordshire lake that became known as the Blackpool of the Potteries. 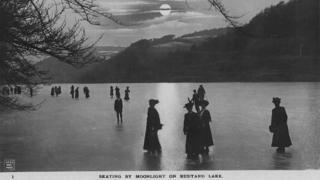 In the Staffordshire Moorlands, on the fringe of the Peak District near the town of Leek, is a man-made reservoir that for decades was a place to where crowds in their thousands flocked - in sun and snow. Rudyard Lake attracted visitors from the six towns that make up present-day Stoke-on-Trent. It earned the title the Blackpool of the Potteries, although one local hotel preferred a more continental comparison, dubbing it the Geneva of England. Up to 20,000 people a day would travel to the two-and-a-half-mile-long stretch of water in 19th and early 20th Centuries - an early example of mass tourism in the UK. 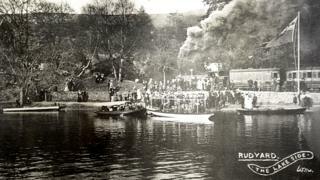 This next photo shows a busy lake gala in 1909. Rudyard is returning to the late 1800s this Bank Holiday weekend with the Day At The Lake event - a re-creation of the lake's day-trip heyday. Events include a repeat of a daring tightrope walk in 1864, when African-American Carlos Trower crossed the lake on a rope suspended some hundred feet above the water. 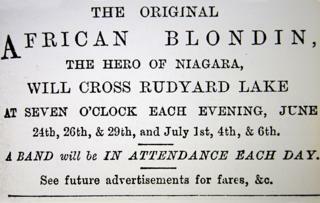 Trower - known as "The African Blondin" after the French tightrope walker Charles Blondin - returned to Rudyard 14 years later, for repeat performances. Captain Matthew Webb - who in 1875 became the first man to swim the English Channel - also visited Rudyard. 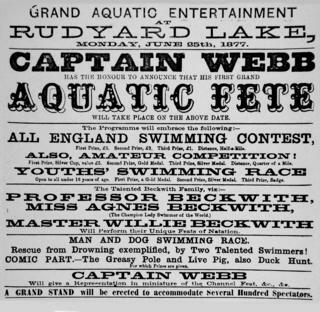 In 1877 he was top billing at a grand "aquatic fete". The event included a demonstration of his channel swim in front of a grandstand full of people. 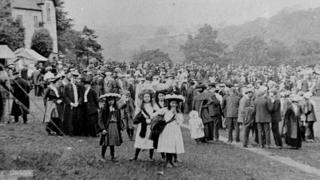 Even though the event was held on a Monday, an estimated 25,000 people watched him - with shops and factories in nearby Leek closing for the occasion. 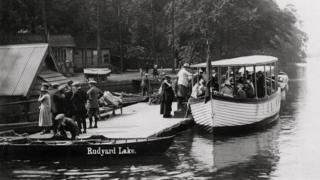 Many thousands of people visited Rudyard to take in the scenic lake views and breathe in the fresh air. In 1863, courting couple John Lockwood Kipling and Alice Macdonald did the same. They loved the place so much, that two years later they decided to name their son after the beauty spot. 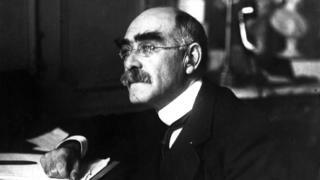 Rudyard Kipling - pictured below - went on to become one of the UK's best-loved writers. The North Staffordshire Railway arrived in 1850. The tracks brought day trippers to the lake - but also helped more than 40 local farmers. They relied on the trains to take their produce to Leek and Macclesfield markets - and their milk further afield to Manchester and London. 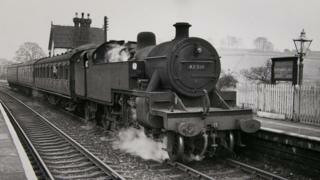 Passenger services to the lake stopped in 1960 - with freight services ending in 1963. The track was then lifted. Getting out on the water - with or without a dog - proved popular. 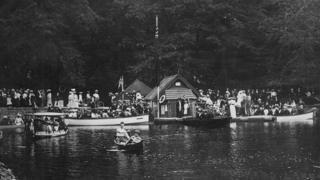 This next image from 1912 shows queues at one of the boat booking offices around the lakeside. And by the 1920s there could be as many as seven large pleasure boats out on the lake at any one time on a summer's afternoon. 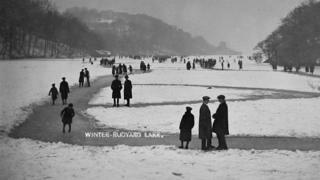 Cold winters did not deter visitors to Rudyard. 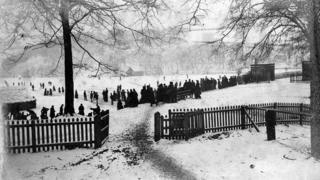 This was the snowy scene in 1890. Some years the lake froze over - and paths were cleared on the ice. 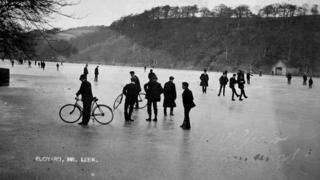 And during the Big Freeze of 1907, the lake became an ice rink. The edge of the lake provided a backdrop for large social gatherings and trades' union meetings. 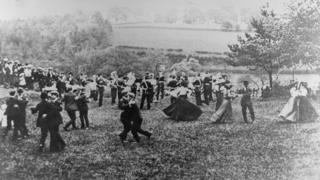 In this photo from 1907 - as a brass band plays - men largely dance with men, and women with women. And this next image - also from 1907 - shows part of a 25,000-strong crowd gathered for a trade union event. 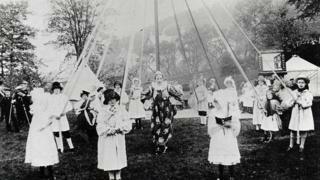 Maypole dancing was popular in the village too - this image is from 1905. From the start of the 20th Century, golf became an option. 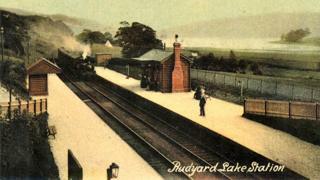 This next image was a postcard issued by the North Staffordshire Railway in 1906 - sold in packets of six at the station - and promoting the newly-formed Rudyard Lake Golf Club. 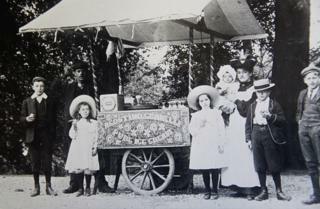 These day trippers in 1905 were enjoying ice cream kept cool using water from a nearby spring. The chiller inside the cart required constant re-filling to ensure the ice cream didn't melt. The hotel by the station offered an extensive food and drink menu. The image on the left dates from the early 1870s, not long after Henry Platt took over the tenancy. Under Platt's management the building was enlarged considerably - including a new wing with a ballroom. 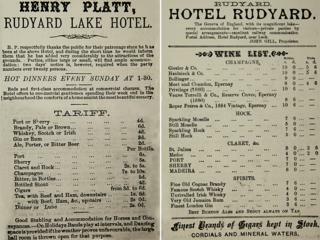 The hotel was in new hands by the time the wine list on the right was published. 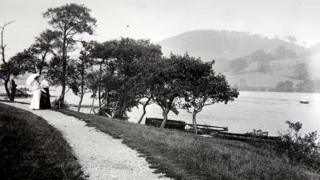 The new manager, John Gill, was keen draw the comparison between Rudyard Lake, in the heart of the Staffordshire Moorlands, with Geneva, in the heart of the Swiss Alps. 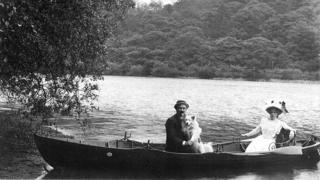 Thanks to Horton Parish Archive / Basil Jeuda Collection / The Rudyard Lake Archive. A Day At The Lake - 30 April to 2 May 2016, Rudyard near Leek, Staffordshire. History of Carlos Trower "The African Blondin"